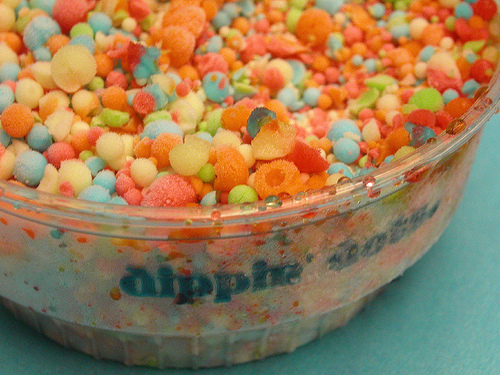 Dippin’ Dots, the ice cream of the future, filed for bankruptcy today. Kind of ironic. The ice cream of the future has no future. I was at the store today when I heard thunder. It was then followed by a fine mist that fell on to the rows of vegetables. This made me wonder. Why do we have to make a noise to simulate a real rain storm? It doesn’t keep the vegetables any fresher. Then came the realization that would change my views of the earth forever. The vegetables asked for noise. That’s why ever grocery store around the nation makes a fake thunder noise when misting their veggies. So the produce won’t be angry. I’m not going to sleep tonight. Very funny instructional video of what to do if an earthquake happens. P.S. I didn’t make this video. Ok, so today at around 7:30 I heard the shriek. Slowly, people started to run out of the classroom. I didn’t realize what was happening until it was crawling under my desk. A huge, hairy spider. Running under my chair. That’s sort of what pushed me over the edge. Luckily, Mr. Hill squished the spider. Under my chair. I didn’t let my feet touch the ground for the rest of the period. Yes, a post about melons. There have already been 16 deaths concerning “bad” melons. Why am I still eating Cheerios? Just a quick question: am I dead? Saturday morning, I was eating cereal. It was the kind of cereal that’s “high in fiber” and “low in taste.” Bland. Very Bland. There is no “cheer” in Cheerios. Only blandness. Very bland blandness. I was eating my blandios when I realized something. Isn’t it the 21st? The day the world ends? The day we all die? The day life is no more? So I checked the calendar. Yep. Saturday, the 21st, the day Jibbles ate his blandios, and nothing else. No apocalypse. No destruction. No boom. Guess we’ll have to wait for December of next year.